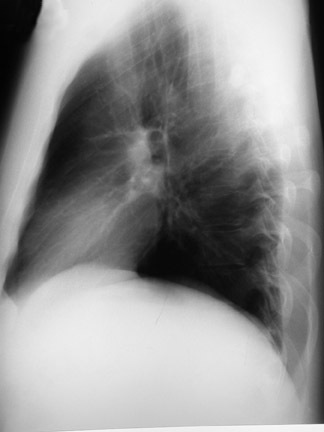 The PA radiograph of the chest was normal (Figure 1A). The lateral radiograph showed a streak of gas outlining the posterior pericardium and portions of the descending thoracic aorta, which was suggestive of pneumomediastinum (Figure 1B). 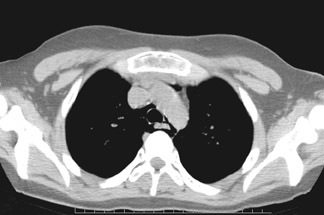 Spiral CT of the chest revealed the presence of free air within the mediastinum, with no evidence of pulmonary embolism (Figure 2). Repeat PA and lateral radiographs obtained 96 hours after admission showed resolution of the previous ﬁndings (Figure 3). The patient was treated as an outpatient with analgesics and clinical follow-up. The diagnosis is conﬁrmed with conventional chest radiography. Posteroanterior and lateral views show radiolucent streaks of gas that outline mediastinal structures. If enough air is present, the thymus can be outlined (thymic sail sign). 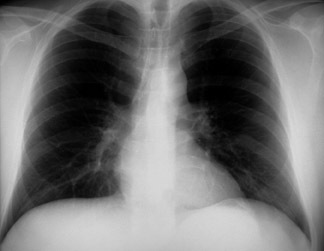 Continuous diaphragm sign (best seen in a frontal radiograph taken at expiration that shows a thin band of gas between the heart and diaphragm, making the diaphragm visible where it is normally obscured by the heart). CT of the chest can be used when the diagnosis is unclear or when there is a clinical suspicion of another pathology.10 Diagnostic tests such as esophagography and bronchoscopy are useful in ruling out traumatic or spontaneous esophageal (Boerhaave’s syndrome) or bronchial tree ruptures. Chest radiography is usually sufﬁcient in making the diagnosis. 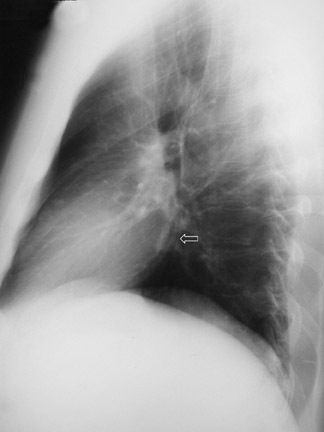 Spontaneous pneumomediastinum must be considered as part of the differential diagnosis when evaluating a patient in the emergency department for acute chest pain. It is particularly relevant in cases of young patients with a history of asthma or inhalation of psychoactive substances or when the symptoms are related to Valsalva maneuvers. 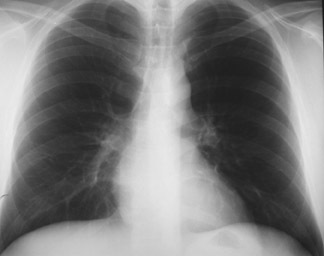 It has multiple radiographic signs on plain chest radiography, some of which are appreciated only on lateral views. CT plays an important role in the initial evaluation and is helpful in excluding other causes of pneumomediastinum or chest pain. Stable patients can be managed on a medical basis with analgesics and follow-up imaging. Lantsberg L, Rosenzweig V. Pneumomediastinum causing pneumoperitoneum. Chest. 1992; 101:1176. Patel A, Kesler B, Wise RA. Persistent pneumomediastinum in interstitial ﬁbrosis associated with rheumatoid arthritis. Chest. 2000;117:1809-1813. Macklin MT, Macklin CC. Malignant interstitial emphysema of the lungs and mediastinum as an important occult complication in many respiratory diseases and other conditions: An interpretation of the clinical literature in the light of laboratory experiment. Medicine. 1944;23:281-358. Panacek EA, Singer AJ, Sherman BW, et al. Spontaneous pneumomediastinum: Clinical and natural history. Ann Emerg Med. 1992;21:1222-1227. Abolnik I, Lossos IS, Breuer R. Spontaneous pneumomediastinum. A report of 25 cases. Chest.1991;100:93-95. Bratton SL, O´Rourke PP. Spontaneous pneumomediastinum. J Emerg Med. 1993;1:525-529. Ralph-Edwards AC, Pearson FG. 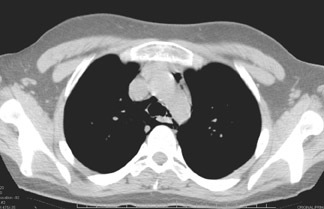 A typical presentation of spontaneous pneumomediastinum. Ann Thorac Surg. 1994;58:1758-1760; Comment in: Ann Thorac Surg. 1995;60:1457. Ba-Ssalamah A, Schima W, Umek W, Herold CJ. Spontaneus pneumomediastinum. Eur Radiol. 1999;9:724-727. Zylack CM, Standen JA, Barnes GR, Zylack CJ. Spontaneous pneumomediastinum revisited. RadioGraphics. 2000;20:1043-1057. Bejvan SM, Godwin JD, Pneumomediastinum: Old signs and new signs. AJR Am J Radiol. 1996;166:1041-1048. Holmes KD, McGuirt WF. Spontaneous pneumomediastinum: Evaluation and treatment. J Fam Pract. 1990;31:422-429; Comment in: J Fam Prac. 1991;32:128. 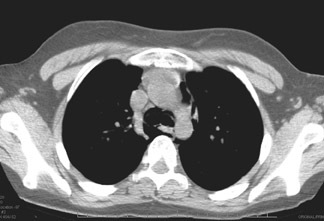 Spontaneous pneumomediastinum (SP). Appl Radiol.